“I’m a marketing consultant, what do I really know about Crowdfunding?” was the dialogue going on in my head when I received a phone call from a respected agency in Massachusetts asking if I was available to develop a presentation on Crowdfunding for their semi-annual meeting of non-profit agencies. Sold! She loved this angle so I was hired and began to think of the best way to put together a dynamic, one-hour presentation on Crowdfunding, making it valuable for folks contemplating a campaign to raise funding for their business venture and educational for individuals not ready or just curious to learn more. Most of you know my perspective on luck, we create our own as we proactively do the ‘right’ business activities. So, as luck would have it, one of the women I’ve been mentoring over the last 10 years, Joanna Alberti, approached me as I was searching for the right story to share. She asked me if I thought it was a good idea to create a Kickstarter campaign to fund a booth at Surtex, one of the top licensing shows held annually in NYC. If you’ve read either (maybe even both) of my books, you are familiar with Joanna’s story. In 2005 she launched PhiloSophie’s®, a stationery and card business featuring the fabulous and fearless character, Sophie. Joanna has already experienced a lot of success having been named the “Top 25 Under 25 Young Entrepreneurs” by Business Week and her cards can be found around the U.S. in stores like Target and Wegmans. Now Joanna wants to take her business to the next level and was curious to learn if Crowdfunding was a good way to support her dreams. Damn – some times things fall perfectly into place and this was clearly one of those times. I definitely thought this was a great idea (not just because I needed a case study) but because Crowdfunding is a perfect match for her business. To scale, Joanna needs more exposure, the kind that requires licensing her products to manufacturers. Combined with the fact that she is a part of the creative economy this was, without a doubt, a perfect fit. 1) Start with a SMART Goal. You’ve heard me talk about SMART goals before. Make sure your goal is Specific – Measurable – Actionable – Realistic and Time-Based. Of critical importance is ensuring your results are measurable in terms of dollars funded for your project, profit after fulfilling perks, exposure to new potential customers, and ROI on your time to create and fulfill the campaign. 2) Think Location, Location, Location. Even online location matters so review the different Crowdfunding platforms. You have likely heard of the two major players (Kickstarter and Indiegogo), but there are do-it-yourself models and lots of other small players. They all have different audiences, criteria, and success rates. For example, Kickstarter campaigns have a 44% success rate, as opposed to Indiegogo whose success rate (according to sources like TechCrunch and the Verge) is only 9.3%. Data shows that 83% of Indiegogo companies have not raised at least 25% of their goal. It’s important to understand the differences amongst the various platforms. Below I have provided details about Kickstarter and Indiegogo. However, there are many important details to consider when selecting your host location, so make sure you ask the right questions before you select a site. Kickstarter is an all-or-nothing model, meaning that if you don’t hit your goal you do NOT get to keep any of the money. However, if you don’t hit your goal you are also not obligated to fulfill the perks. If you do meet your goal you will be required to pay them 5% of what you are funded (plus an Amazon processing fee). Indiegogo will allow you to keep all of the donations you receive (even if only raise a buck), but if you do not hit your target donation goal you will pay them a 9% fee (to keep the funds). If you hit your target you only pay a 4% fee, lower than Kickstarter. However, if you don’t hit your target and keep the money donated, you must fulfill all of the perks promised. 3) Perks Engage and Support Your Brand. Give yourself time to develop perks that excite and interest your audience. Remember, these are branding opportunities so make sure whatever you give away, it is related to your business to help build your brand power. That means don’t give away a toaster if you’re a video producer. 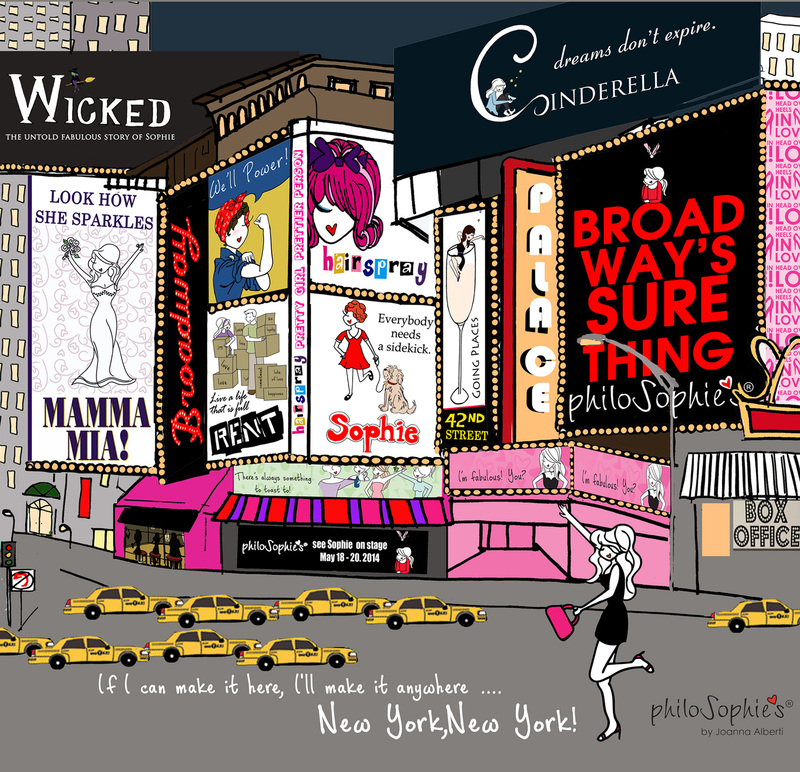 For PhiloSophie’s® Joanna decided to create 3 Limited Edition versions of Sophie in New York City. These are beautiful renderings only available to Kickstarter donors – something you will NOT find on her website. Depending on how much is donated, the design is offered in different formats ranging from notecards and prints to recyclable totes and trays. 4) Perk Fulfillment Must Be Realistic. Make sure your perks are cost effective so that fulfilling them doesn’t equal (or exceed, yikes) the price of the donation or you’ll find yourself in the same or worse financial position as you were at the beginning of the campaign. Easily said, this needs to be strategically determined. For example, offering mugs can be twice as expensive to fulfill as recyclable bags when you consider packaging and shipping costs. Plus, how many people are going to see a mug on the donor’s desk (unless they’re wildly popular) compared to the number of people who will see your design on recyclable bags every time the donor takes them to the store. 5) Understand Donor Categories. Most people will donate at the lower end ($50 and under), so make sure you offer and can easily fulfill those perks so you’re not tarnishing your brand by not sending the promised items out in a timely manner. Joanna and I created an excel file with all the perks, cost, and profit for each and how many we would need to meet her donor goal and her actual profit (amount funded minus the cost of goods sold, including her time). Again, you don’t want to spend 50 hours on a project that ultimately only generates a couple hundred dollars (you could work at a fast food chain and make more money). 6) Determine Approximate Range of Donors Required for Profit. Create a simple excel file that shows donation total, profit, and number of funders in each category. Manipulate the cells for the “number of funders” to see how much donation revenue and profit you’ll make depending on how many people donate in each category (i.e., 50 donors give $10 and 2 give $150). This creates a visual starting point so you understand approximately how many folks you need to make enough money to take your business to the next level. Continue plugging the actual numbers into the excel file as the campaign progresses so you know how profitable the campaign will be. Notice how these benefits are precisely what you will achieve from a marketing campaign to promote your business. I know you wouldn’t dream of putting together a marketing campaign and not follow through with the all activities to ensure its success. Crowdfunding is no different. Focus on ensuring its success to achieve benefits that exceed the donation amounts. 8) Launch an Integrated Campaign. Once you recognize the critical marketing benefits you can achieve, now is the time to create and launch your fully integrated marketing campaign. You want to ensure that your friends and family are not the sole sources of your funding. If that is the only audience you reach then you have lost an important opportunity to expand your reach and target new customers. To expand your customer touchpoints you need to focus on a variety of online and offline tools. 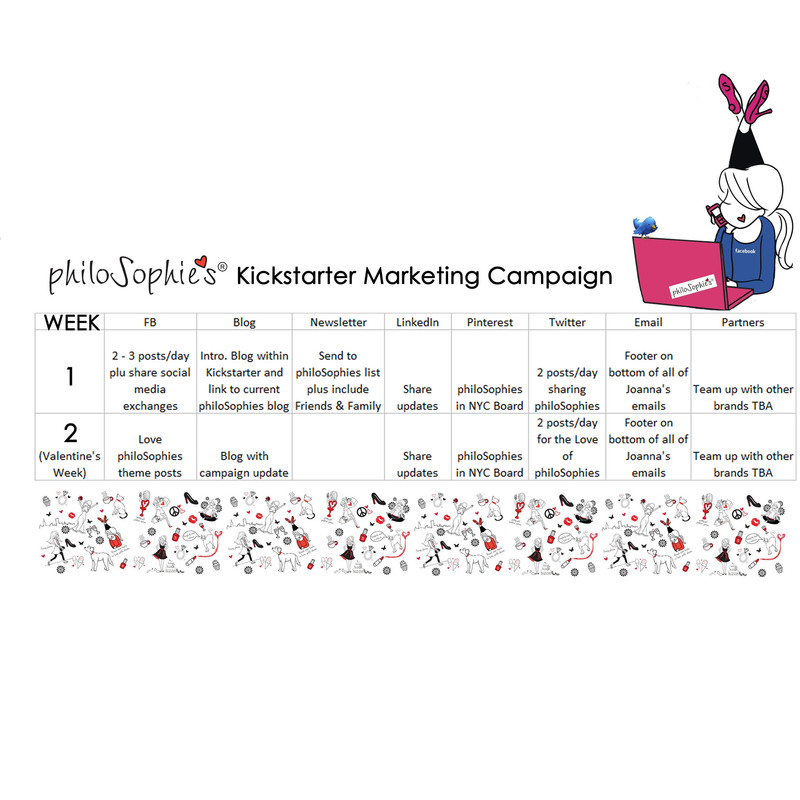 For PhiloSophie’s® this included: email blasts, Facebook posts, Blogging, Tweeting, LinkedIn shares, newsletter outreach, and partnering with other brands to promote the opportunity. Don’t underestimate the time it will take to develop and run the campaign for the 30 days (or whatever time period you select) until you are completed. Many donations come in at the very end… you will want to ensure you have the ‘marketing copy’ ready to roll out the campaign before you launch (remember, you’re still running your business while managing this campaign). 9) Measure, Analyze, and Course Correct as Needed. You must review the metrics that tell the story of your campaign’s success (or failure – but hopefully not). Even if you hate number crunching, this process is critical to ensure you are achieving your stated goals and can make changes as required if something isn’t working as anticipated. Here are some numbers you should focus on, but each campaign is different. Most of the Crowdfunding sites offer tools to help you do this. Best of luck growing your business and using all the marketing tools available to build your brand. If I can be of any assistance, don’t hesitate to email me at beth@m-edge.com. Click here to check out Joanna’s campaign!